For the Easter holiday, I thought I would adapt our mushroom quiche recipe into a Spring brunch dish, with asparagus and ham. It turned out great, my one note is to not add any salt as the ham brings enough salt to the party. The hallmark of a good quiche is that creamy, custardy texture that you get when the quiche is baked just enough without becoming over-baked and rubbery. To achieve this, pull the quiche from the oven when the sides are set, but there’s just a bit of wobble in the middle when you gently shake the pan. The quiche will set completely as it cools, and you’ll be left with a perfectly silky slice. You can make this quiche up to three days in advance. Store it in the refrigerator, covered. Let the quiche come to room temperature on the counter before serving, or gently warm it in a 300° F oven. To freeze a baked or unbaked quiche, let the quiche cool completely, place it on a baking sheet, and let it freeze overnight. Once frozen solid, wrap it tightly in a double layer of foil and place inside a freezer storage bag. Freeze for up to two months. Do not thaw before reheating or cooking to avoid a soggy crust. If reheating a pre-baked quiche, place in a cold oven, set the oven to 350° F, and bake for about 20 minutes or until warmed through. If cooking an un-baked quiche, bake the quiche as directed in the recipe (starting in a cold oven), but add about 10 extra minutes to account for cooking it from frozen. Want More Great Quiche Recipes? Updated April 8, 2019 : We spiffed up this post to make it sparkle! No changes to the original recipe. 1 Roll out dough and fit into tart pan, then freeze: On a lightly floured surface, roll out dough into a 12-inch circle. 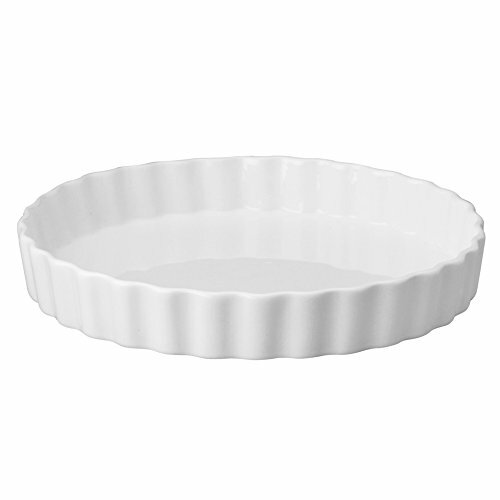 Fit into a 10-by-1 1/2-inch round tart pan (with or without a removable bottom), pressing dough into corners. Transfer to freezer to chill for 30 minutes. 2 Pre-bake tart crust: Preheat oven to 350°F. Line pastry with aluminum foil, pressing into the corners and edges. Fill to the top with baking weights — sugar, dried beans, or rice. 3 Cook shallots and asparagus: Heat oil in a large nonstick skillet over medium high heat. Add shallots, and cook, stirring, until translucent but not brown, about 1 minute. Add asparagus. Cook, stirring frequently, until asparagus are just cooked (al dente), slightly browned, firm, not mushy, 8 to 10 minutes. Sprinkle half the cheese evenly over the bottom of the crust. Spread asparagus and ham over the cheese and then top with remaining cheese. In a medium bowl, whisk together milk, cream, and eggs. Season with fresh ground pepper. Pour over cheese. 5 Bake: Transfer to oven, and bake at 375°F until just set in the center, 30 to 35 minutes. Cool on a wire rack for about 10 minutes before slicing. Hello! All photos and content are copyright protected. Please do not use our photos without prior written permission. If you wish to republish this recipe, please rewrite the recipe in your own unique words and link back to Ham and Asparagus Quiche on Simply Recipes. Thank you! Delicious! Just made for brunch with a friend, and she took half home for leftovers. Perfect for leftover grilled asparagus. Added two extra eggs (medium size), halved the cream/milk measurements, added half a block of diced dill havarti and added white pepper/dill to the egg mix. So good. P.s. use the pre-cubed ham in the ham section to work smarter, not harder! Your proportions are perfect. Most quiche receipts have me either throwing away filling or cooking them in a ramekin. The texture is amazing. Thank you for sharing!! I’m so glad you liked it Dona! per Sophie’s comment I caramelized the shallots and added butter for that. Since I live rural I used the swiss cheese I had on hand, The ham was cooked so I just defrosted it, used canned milk (one can), a tablespoon of butter to richen it up, and a few chopped fresh tomatoes (with liquid and seeds removed) and a 1/2 teaspoon of nutmeg. delicious. I also used the very skinny asparagus. I made this quiche this afternoon. It took 2 HOURS of prep time. I would highly recommend that you cook the asparagus first and then add the shallots, cause those little suckers will brown too fast if you turn your head away for just a moment. It tasted OK; but, I would never go through that again. Waaaaaaay too much work for a quiche. I only used this recipe for the crust part of this recipe and it came out sinfully delicious! I just made this to bring over to my bf’s tomorrow night as a late night snack and our breakfast the following morning. He’s going to swoon when he takes a bite. 2 amendments: I used a pre-made pie crust (cut into sections, then rolled it out a bit to fit my extra-large pie dish) and fried up the ham a bit before-hand. My only issue –and it’s a really tiny one– is that it’s missing a subtle layer of sweetness to counter balance the saltiness in the cheese and ham. The next time I make this, I’m going to caramelize some onions to add to the base. Overall, very yummy. I substituted 1/2 cup of half-and-half for the 1 cup of milk/cream and added one more egg. I also used smoked salmon instead of the ham and a mix of parmesan and cheddar for the cheese. Baked for about 40 mins. Turned out delicious, even though the crust was far from perfect (my fault – I skimped too much on the water). I made this Quiche on a Sunday morning and it turned out a bit runny rather than firm. As mentioned by other reviewers, the quiche tends to fall apart during cutting and serving. I was following exactly the same cream, milk and eggs ratio. I am wondering if I can add 1 additional egg to the same amount of liquid to make them bind better? Anyway, the taste is quite delicious and I am satisfy with the result. I am wondering if I can make this quiche on a Sunday, let’s say, then freeze it, then defrost it and serve it for an Xmas party that Friday. It would be in the freezer for about 4 days. Also I might be serving it cold, though I guess I could pop it into the microwave before serving that Friday for lunch. I made this and the crust yesterday my first attempt at making a quiche, OMG it was soo delicious and perfect, thank you very much! My 5 year old and 2 year old loved it… Will make this again sooon.. I made this for Easter brunch and it turned out lovely. My husband really like the end result of prebaking the crust. I used regular grated Swiss and we both liked the flavor combination. Tried your recipe over the weekend using both asparagus and brussel sprouts. It turned out delicious. Thank you for the idea and the recipe. I made this tonight for dinner with Canadian bacon instead of ham (since that’s what I had on hand). I also used a frozen pie crust. I baked it an extra 10 min. since it jiggled a bit in the oven after 35 min of baking. I may have used too much cheese or filling since the liquid spilled over a bit. And when I cut into it, the middle was still a bit mushy/watery after cooling it for 30 min. Otherwise, it tasted wonderful. Next time, I would like to try a different cheese since Gruyere was a bit too decadent for my taste and maybe some peppers to give it a spicy kick! If you are having trouble with soggy crusts it may be worth the extra trip to a health food store or a store that sells whole wheat quiche crust. It has no trans fat or chemicals and is much better for your health. Instead of crustless quiches you can eat these crusts without guilt. I never use mushrooms unless precooked as they will leave a lot of water in your quiche. Make sure you preblanch the vegetables and dry them well.Dry the asparagus well. Also I use 1.5 cups of half and half with 4 eggs and 1 cup Swiss cheese. Emmental or gruyere are all similar. This combination never leaves it soggy. I prebake the crust at 400C for 10 minutes. I loved this recipe. I used bacon instead of ham and I added some chives to the egg, cream, and milk mixture before pouring it on. I also sprinkled a good bit of gorgonzola cheese on top and put a little less gruyere than called for (I substituted emmenthal), which I highly suggest. This quiche was de-licious. Mmm, mmm. My sister and I made it this evening along with your green bean/thyme/almond recipe in an effort to use up the vegetable drawer contents. We used Swiss cheese instead of Gruyere since it was $19.99/lb! Any ideas where I can find affordable Gruyere? Thanks again, Elise! Unbaked pastry shell? No worries. After decades, yes I’m that old, of struggling to find a bottom crust that isn’t soggy, here it is. Bake your raw pastry quiche or pie in the bottom third, or lowest shelf of the oven at 425 F. for 30 minutes; drop the temp. to 350 F. for the remainder of time. For the recipe above, I baked mine 15 minutes longer. For pumpkin pie or fresh berry pies, 30 minutes at 350 F. is usually enough. No, the crust doesn’t burn, at least not in an electric oven, if your oven temp. is accurate, but it browns nicely. I use real butter in my pastry shells, so if you use some other fat/s, keep an eye on it just to be sure. Oh, I used non-fat half ‘n half in place of heavy cream, ’cause my love of 35 years likes real full fat cheese! It was wonderful. I loved this recipe, except I omitted ham.This quiche turned out perfect. Thankyou Elise for easy to follow steps! Why do many quiche recipes recommend an unbaked pastry shell? I don’t see how any quiche recipe can result in a decent shell on the bottom without pre-baking it. I just prepared a Quiche Lorraine and I neglected to pre-bake the shell, and guess what,… the bottom of the pastry shell was mushy and virtually uncooked. I make quiche infrequently, and agonize over this detail whenever I do make it. Thanks for any advice.